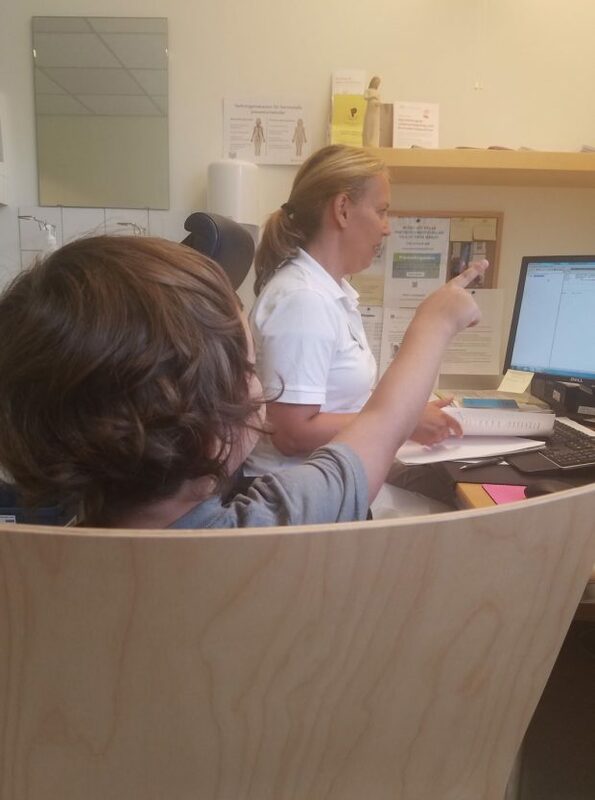 My son was with me at nearly all of the appointments, particularly curious & engaged when Anna took my blood pressure or listened to the baby’s heartbeat. He would often pull up a chair to sit as close to her as possible & was so curious about what she was doing on her computers & with her paperwork! Excited about baby belly starting to show & about my boisterous little boy being part of the belly documentation process! 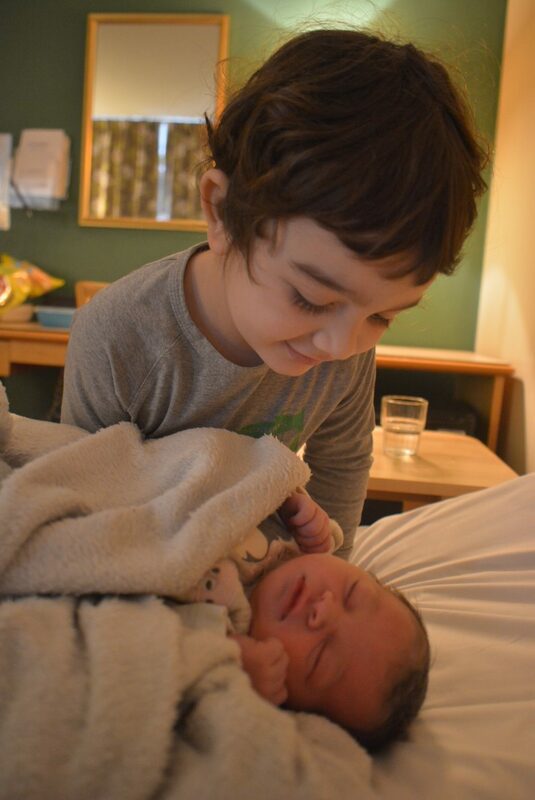 During this pregnancy, I looked back on my son’s birth story a number of times, grateful I had written it down as I had forgotten many of the small but tender details as time passed. 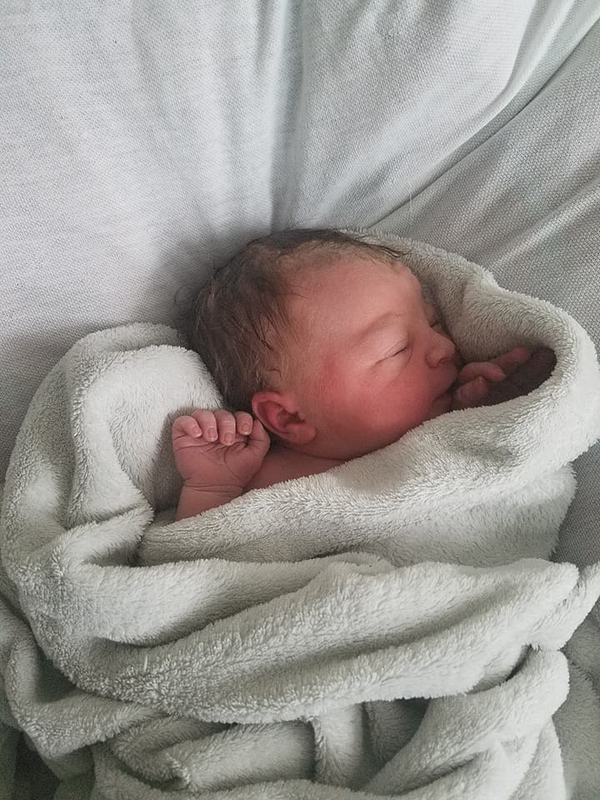 I posted my first labor & birth story here: http://annikalundkvist.com/2013/12/02/birthing-hunter/. 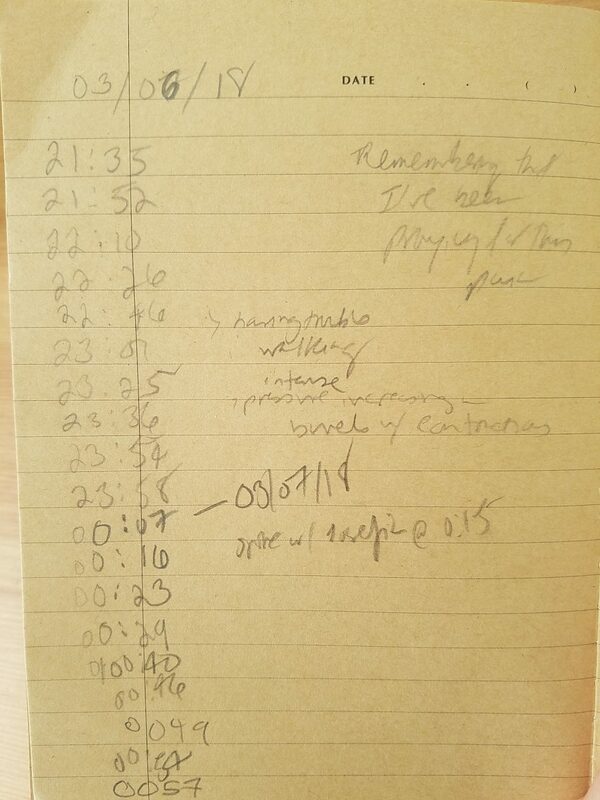 For me, writing down the events of my two birth & labor experiences has been mainly about memory- documenting the details so I can look back, read & remember. 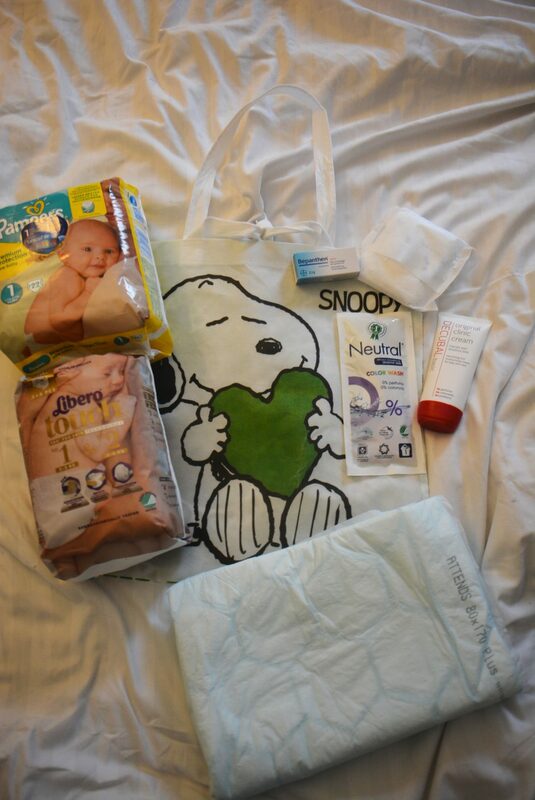 I experienced the pregnancy with my daughter from start to labor here in Sweden. Here, care from prenatal forward is governed by midwives. You generally only get referred to see a doctor if there is a complication. Otherwise, all of your care is with midwives who first study, train & get a degree in nursing (which takes three years) & then an additional year & a half of study & training to be a midwife. 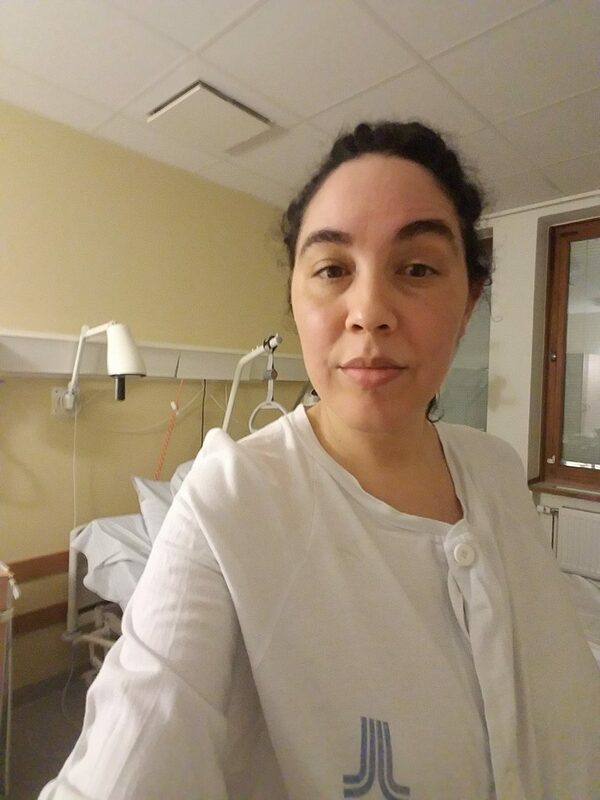 I did not have a single physical exam during prenatal care here in Sweden beyond standard blood tests, weight check, blood pressure & belly measuring. The entire experience was definitely much, much more low key than the prenatal care I received in the US; different systems & apparently the Swedish model is a more cost efficient model that also emphasizes less intervention. My daughter was dropped low & engaged for over a month before birth. 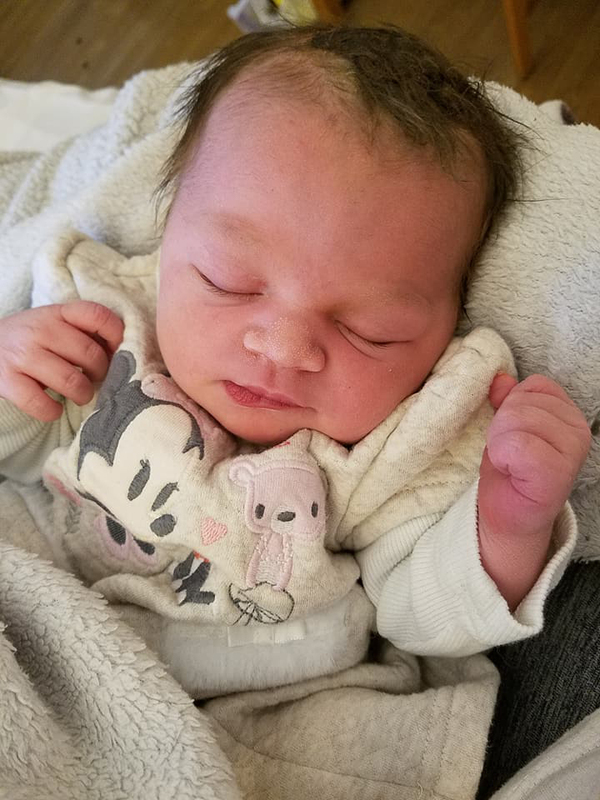 Although we knew this bore no indication as to when she would be born, both my husband & I were anticipating an arrival a couple weeks before her due date. During those last weeks, the hope that labor would happen any day & a sense of waiting really intensified. Waking up each day there was great hope that this, this would be the day. 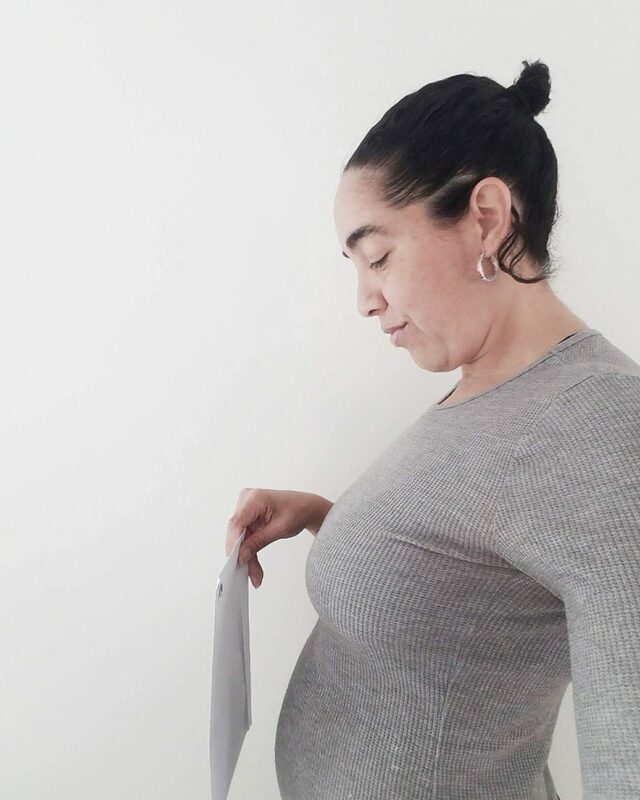 There were no complications during my pregnancy but I definitely had some grappling with anxiety, mainly due to the worrisome aspect of my mind. I was just hopeful for a healthy pregnancy, good labor & that I would have a healthy baby girl and sometimes became anxious about the what if’s. The weeks went by & passed right by her March 2, 2018 due date. That’s when I began taking copious journal notes as well as emailing my mother frequent updates. The following account is compiled from journal entries, memories, notes by midwives who cared for me & the many emails that I sent to my mother over the week & towards the end, when I was in the hospital, to my husband as well. This was the due date set for my daughter & by the time it arrived I was beyond eager to go into labor but also feeling a new calm, knowing that it would be any day now. We had our first of a few visits to Labor & Delivery this day when I mistakenly thought my water broke. Well we are back to just being home. Mike is working from home today. Hunter is very busy playing & being excited that his Mama and Daddy are both here. I’m just doing various things on my computer with housing search, photos, working on my website. We’re having a pretty good day. I went for a great walk this morning. It reminded me of when I walked around Lyons Arboretum extensively the day before Hunter’s birth. It felt really good (that day as well as today). I stayed close to home of course but we have woods nearby that I was able to walk in and take some photos. Once again I thought my water broke so we were off to Labor & Delivery late night on this day. Just past midnight & we are back home now. They checked my water & amniotic fluid & it doesn’t appear the membrane was ruptured. Plus I wasn’t having contractions. They monitored the baby’s heartbeat for 30 minutes & also did an ultrasound to check on her. It all really put my mind at ease but all also unfortunately confirmed I am not in labor tonight so we are back home. Hunter was asleep throughout it all & Mike & I are tired & just ready for a good night’s sleep. Before we left, one nurse was very nice &gave us a tour of the delivery ward. If nothing happens by next Friday (when I reach 41 weeks) they will give me the option to induce but until then they are very much more on the patient side here & want to allow labor to begin as naturally as possible. 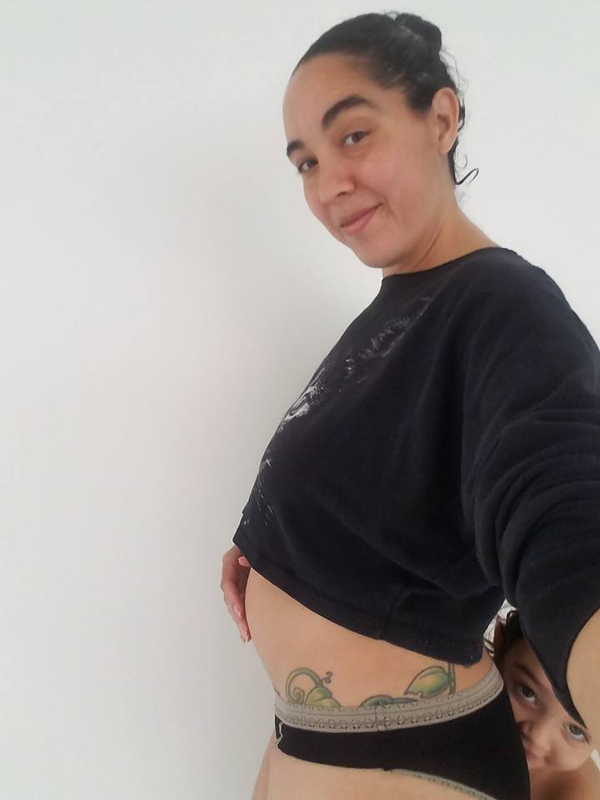 I am anxious, impatient & a bit of a worrier so it’s been challenging for me but I can also feel my body preparing in stages for labor so that’s been something to experience. In my memory, this is when it really started. I started writing down contraction times, knowing that were not yet patterned & regular but wanting to keep track. Looking back, I can see how I interpreted this new phase hopefully as the beginning of labor but it was in fact the beginning of prodromal contractions. It was the introduction of pain during this pregnancy. I had been feeling Braxton Hicks on & off for some time but never minded those (in fact I loved feeling them). But this evening is when what I call the “seizing” sensations began, distinctive contractions that I felt in my lower abdomen & lower back. At some point I remembered I had been praying for this pain for weeks. 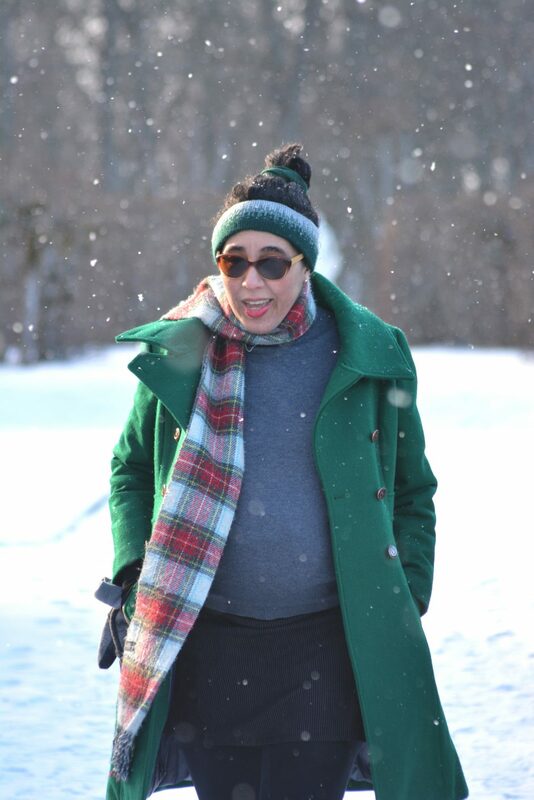 As I neared the last month of pregnancy, I remember feeling the excitement & anticipation of the beginning of labor pain so then I would know the time had come. I began the contraction notes at 21:35. Within an hour & a half I was having trouble walking & feeling intense pressure on my bowels with each contraction. The contractions went into the next day & shortly after midnight we were heading to the hospital. Started having painful contractions last night at around 9 pm. The labor & delivery ward encourages women to stay home & comfortable as long as possible but the contractions were getting pretty intense by around midnight so we went in. They immediately set us up in a labor & delivery room which was comfortable & also had a bed that we put Hunter in as he was already asleep & slept thru our whole time there this evening. The midwives we interacted with were wonderful and seemed very proactive in also hoping all signs pointed towards me going into labor soon & not going back home. However, I was only dilated 1.5 cm & was still at that around 3:30 am so we were sent back home. Been awake for about 30 minutes. Mike & I both got some sleep in. Contractions have not ceased which is a relief. Waiting for the pain of labor to begin was becoming anxiety inducing but now that the pain is here I’m faced of course with moving through it. The midwife earlier today said that we should return when the contractions were difficult to even breathe through- essentially when they became too much to bear. 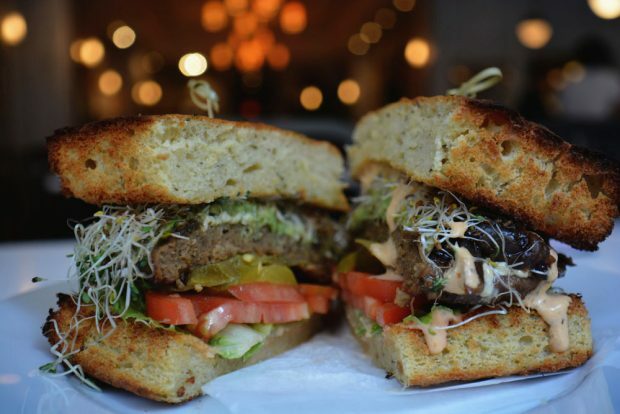 Making sure to have scrumptious, nutritious meals. I made the hot cocoa with oat milk & as I handed my husband a mug he joked sweetly about how his wife even makes him homemade cocoa while she’s in prelabor. Mike back home from work (he planned to work from home today but then needed to go in), now sitting in bed next to me, working on his computer as I relax & watch some food shows on Netflix, breathing through contractions. I understand well now why the midwives here strongly encourage women to stay home & rest though pre-labor. It’s relaxing to be in your own space & get cozy and rested as much as possible through this phase. I am also definitely feeling that ‘extreme nesting’ urge the past couple of days, every little speck of whatever catches my eye & I am compulsively sweeping, mopping & wiping the floor with a light cleaning solution with lemon essential oil added. 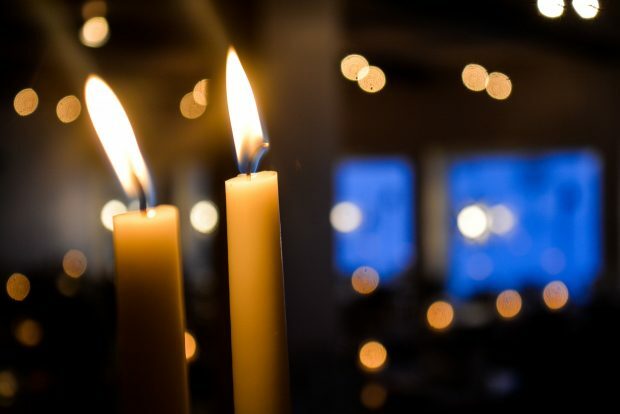 Up until now, I was finding that to manage the pain, if I refocused my attention not on the searing pain in my lower abdomen but rather concentrated my focus on the pain gathering in my lower spine, it was manageable, even interesting. This technique is not working as well with the new contractions. I posted this on my Facebook page late on this night as the contractions began rolling in & was touched by the responses of women I knew worldwide, offering support as well as their own tips for getting through the contractions. This was also International Woman’s Day & it was of profound sentiment for me to think of all these women I knew offering their own experience, love, tips & encouragement. Deep Wednesday night was a repeat of the previous night of contractions. They began late at night& after 3 visits now to Labor and Delivery that resulted in us going home, I was committed to bearing down & just working through it at home. Also my husband and son were sleeping & I knew it would be a hassle to get going in the middle of the snow covered night only to get checked & have to come back home- again. But by dawn I just couldn’t take it anymore & woke my husband up to get ready to go. Contractions just recently went from being pretty manageable to now being really difficult & hard to cope with. Mike & Hunter are both snug sleeping so I am going to move slowly, get dressed slowly, feel out the contractions & then make a decision when to wake Mike up to go. If this continues, it will definitely be sometime within next couple of hours that we get going. Oh my Oh My, it’s time. ZOE PLEASE BE GENTLE. Annika, you are one strong lady. I LOVE you & wish you a gentle delivery. By 5:30 am I was ready to wake my husband up to get going to the hospital. We arrived at Labor and Delivery around 6:15 am. Checking in was becoming old hat! 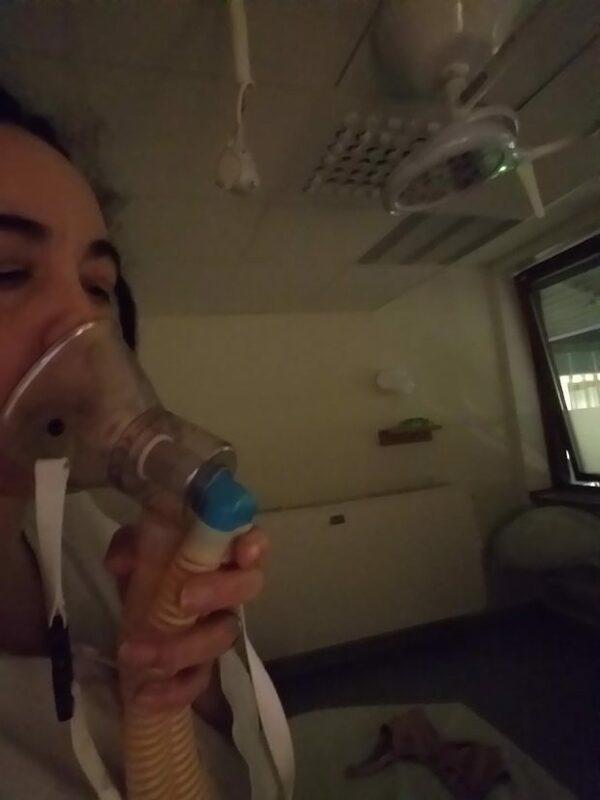 I actually still was not meeting the criteria to be accepted into Labor & Delivery on Thursday morning but I was so obviously miserable & seemingly on the brink of it all really beginning, that they set me up in a room in the antenatal ward (where they happened to have the space) to wait things out. My 41 weeks began the next day anyway & the midwives were also hoping for my sake that labor was super close. By the time they set me up in a room in the antenatal ward it was about 8 am & my son was awake. He was tickled by all the excitement of this new environment & hopped on the hospital bed with me. 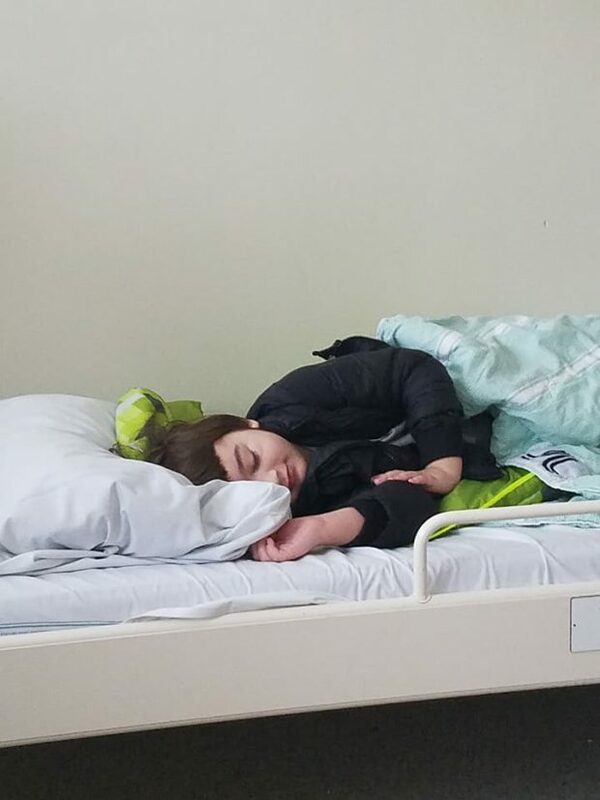 It was clear that my husband & rambunctious son could not stay in the room too long & also it was important I get some rest – it had been two nights now without a proper sleep & my biggest concern at this point was being overtired for or after birth. So after a couple hours spending time in the room with me they left to head back home, just as it began snowing. Har kunnat sova efter T Citidon. 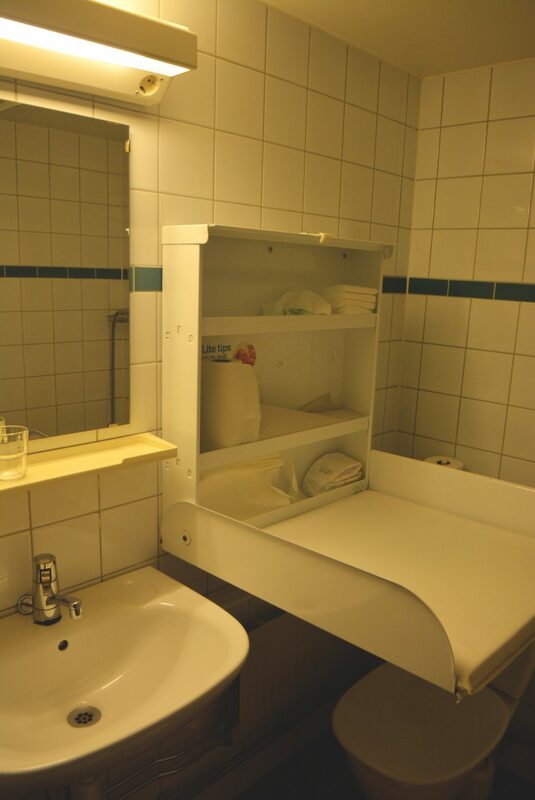 VU: Cx utplånad, öppen 2 cm, fast konsistens, sakral. Bra smärtlindrad av Citidon, önskar får ytterligare 2st. 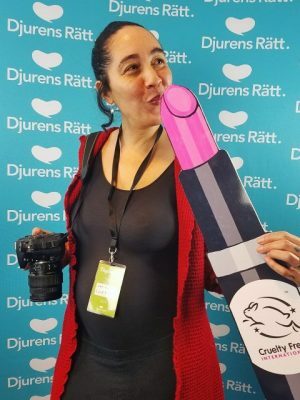 Pat (Patient) får det. Har sovit ett par timmar. 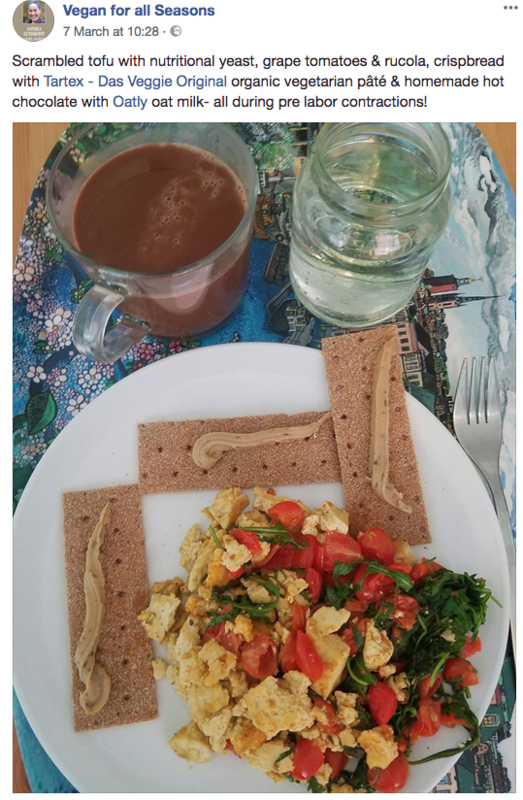 Äter nu lunch. I do regret not getting photos of the CTG checks as the night progressed. This one is of course not when things reached peak but were definitely building. When they reached peak the spikes measuring contractions were three to four times as high. They’re gradually getting me ready. They have an IV in my arm now that they put in everyone preparing to go to labor & delivery. No plans to rush me there yet but they checked & as of 30 minutes ago there were a lot of available rooms. Just showered & am in hospital gear trying to relax & deep rest some more. Love you. The stay in the antenatal ward was something I really appreciated, in order to be close to Labor & Delivery. But after 10 pm, as contractions intensified, I became increasingly distressed & simultaneously very tired. I would be leaning forward on the bed, propped up by pillows or stretched out & almost falling asleep when a new contraction would shock me to wake. As the midwife who cared for & helped me through the night told the midwives at Labor & Delivery when I checked in, I really fought through the night. But by midnight in that room in the antenatal ward I was buzzing her & trying to negotiate for whatever relief I could get. She very calmly asked me what I had in mind & I was very clear that I would be happy with an epidural. But I quickly accepted that these were only administered in Labor & Delivery so I would just have to be patient. 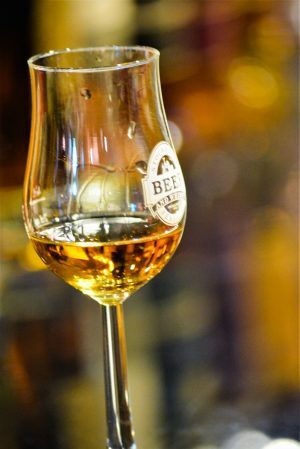 Kopplar bort reaktiv CTG kurva. 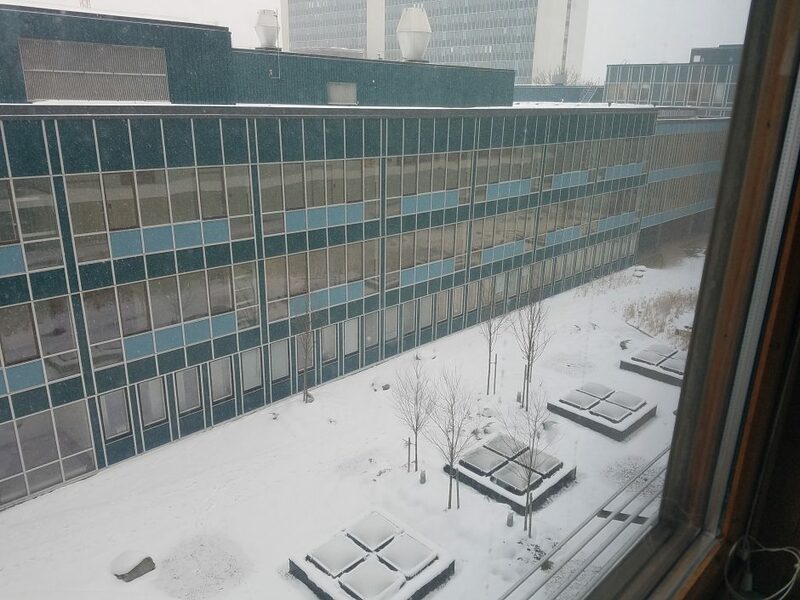 Pat anger att hon har lite effekt av Citidon som hon har fått tidigare. Pat anger att det jobbig. Önskar nåt annat smärtldring. UT ger TENS. Pat anger att hon känner tryck neråt. We ran the gamut of pain management options in that room. The midwife was extraordinarily helpful applying pressure on my lower back when she was with me & contractions came in. She applied an acupuncture needle in my forehead & got me set up on a TENS machine. She strongly recommended hot showers for as long as possible, which I did. 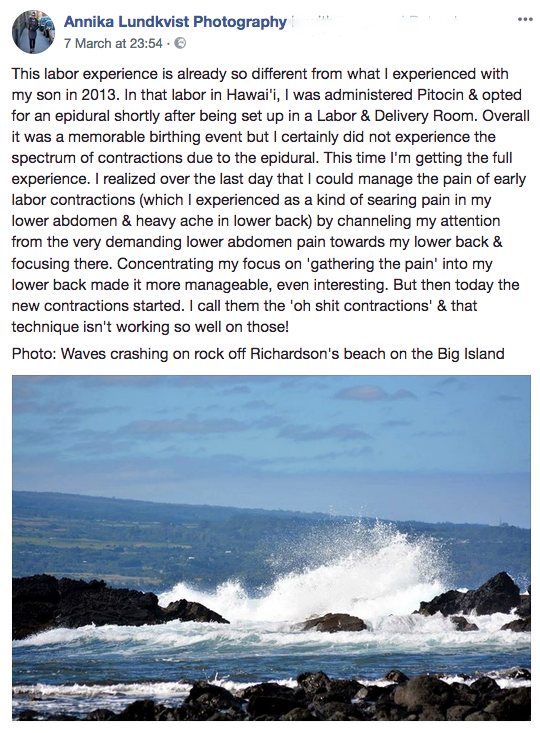 While I have already nearly forgotten how the pain of those contractions felt, I can vividly recall myself in the shower, gripping the bar on the wall & trying to breathe through the steady waves, doubling over, stretching out, contorting my body in whatever way felt like it could provide the most relief through each contraction. It was clear at some point that I struggled to help my body through contractions. My instinct was to tense up with each one when of course one needs to breathe & relax muscles, not intensively constrict which was my initial bodily response. But I fought through- I had no choice. 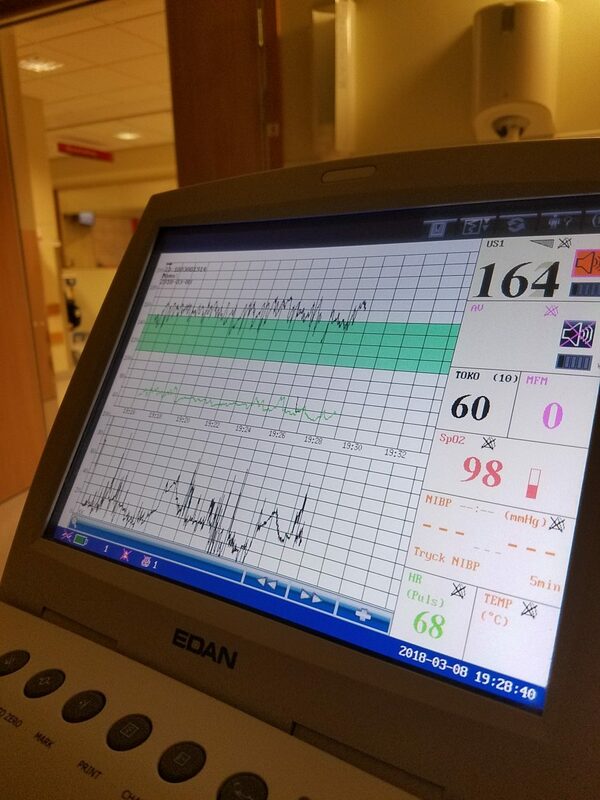 With my son’s labor, I had been administered both pitocin & an epidural within a couple of hours after the really painful contractions had began, so I missed experiencing this crazy ride. Inductions & interventions happen less readily in labor & delivery in Sweden unless medically necessary & the natural result is that women in labor are more likely to be required (whether they want to or not!) to ride out & experience the various natural bodily processes of pre and early labor. They’ve got a tens machine on me & acupuncture needle on my forehead. It may be helping a little but the contractions coming in are oh ‘bleep’. Pat anger att hon inte hanterar smärtorna längre. 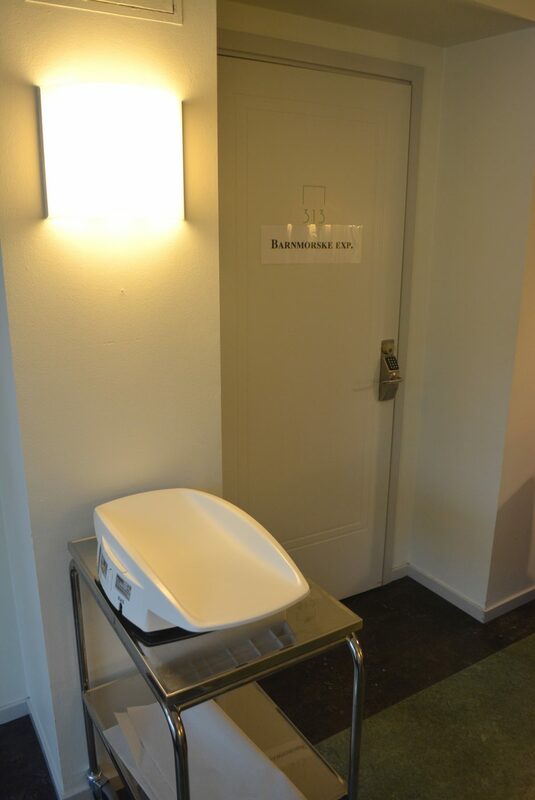 Önskar att bli undersökt. Pat välkomnas till förlossnings avd. By about 2 am, the midwife attending me in the antenatal ward measured me & finally I was at 4 cm!!!! This qualified me both for a transfer to Labor & Delivery as well as an epidural. I was so happy. That walk & elevator ride two floors down to Labor and Delivery with the midwife was a major highlight of the entire week, even including the multiple stops we had to make on the way so I could still my body to get through contractions. The entire mood of this shot during my first hour in Labor &Delivery reminds me of the despair I felt in this moment riding out the sensation of contraction after contraction with little pause in between. I did love that they kept the room dim. It was barely dawn but they maintained it this way right up until push time when it was essential to turn on spotlights. I appreciated their attention to lighting (or lack of it) for the soothing environment it provided that bright lights would have destroyed – for me at least. Önskar EDA vid ankomst. Förberedelser för EDA görs. 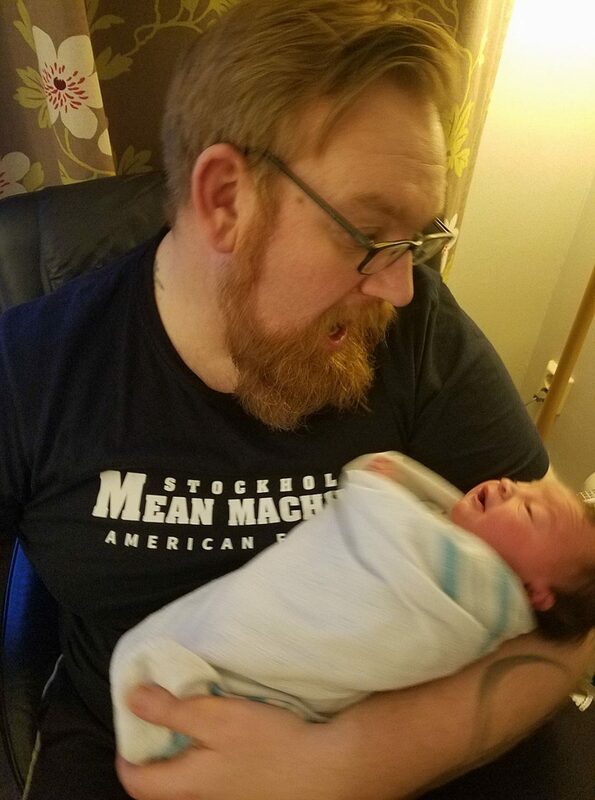 Although arriving in Labor & Delivery was great, welcome relief, I was also at a point of desperation & really struggling through each contraction. They immediately ordered an Epidural for me & in the meantime got the Nitrous oxide machine going. At first the gas provided some relief but quickly the feeling & effects just began to irritate me. Sent you a bunch of texts but in case you check email first when you wake up…. Been in Labor and Delivery room for a couple hours now. Was such a relief to hit 4 cm because that meant I could move into a room here as well as get an epidural. The contractions were wicked rough. Epidural is at work now & they have left me alone to rest a bit. Shortly after I sent the above email to my husband, things really got into motion. As soon I had been checked into Labor and Delivery earlier, three midwives were attending to me. I felt extraordinarily well cared for from the moment I stepped in the room. The anaesthesiologist had been alerted but it took about an hour for him to arrive from my time checking into the room. During that time, one of the midwives was ever present with me & we chatted about motherhood, our children, birth experiences & more. She was very alert to every contraction I was having. If I was standing, she would press on my back for relief when one came in & if I was lying down she would apply pressure into my knees. At some point soon after I sent the email to my husband at 4:24, I was at 6 cm. The midwives knew I had a husband & young son at home nearby & that if possible, I wanted my husband there for labor. He wanted that too, but I also considered that they were probably both in deep sleep & that to get our 4 year old son all dressed for the cold & the drive would take some time. I knew throughout my pregnancy that I might not have them there for labor & I was ok with that. In this moment I had to decide whether to try waking them with phone calls or just let it be. 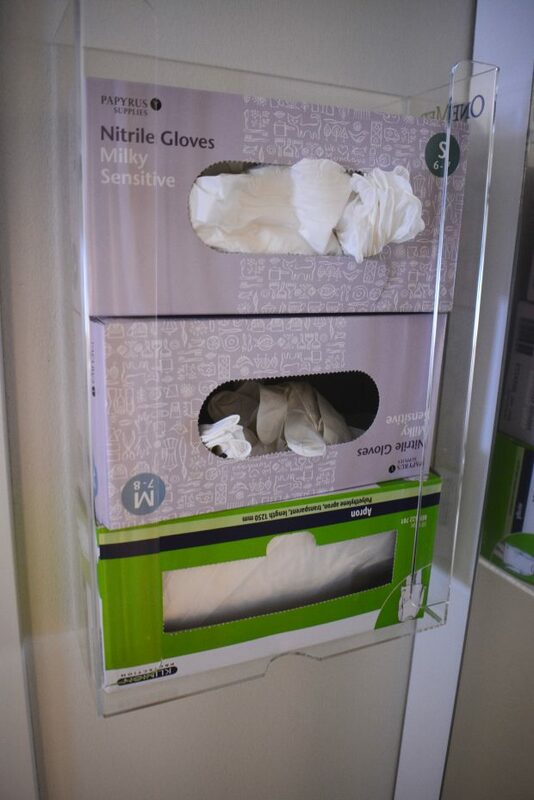 One of the midwives eagerly told me that now would be the time to alert my husband to start getting ready. I decided to let them sleep! Ten cm. Tears of Joy (and maybe fear). Time. I can’t remember the exact time but at some point around 5:20 am the midwives prepared for a dilation check. One of them checked me & I knew by the expression on her face that there had been a development. She was still a midwife in training & said she didn’t want to tell me what it was & get me overly excited in case she was wrong. One of the elder midwives checked & confirmed the younger one’s estimate. I was at ten centimeters!!! I could not believe it. I started crying immediately & they all laughed with appreciation at my response. I was definitely crying with joy that this moment was here but there was also some fear there that the moment was here to face the big event. One of the midwives said now would be the time to definitely wake up my husband if he wanted to be here for the labor & we could take a little bit of time for him to get there before starting. I knew that the shift for these three midwives who were caring for me would be ending soon, at 7:15 am. I thought how great it would be for Mike to be here for the labor but again that it would take him time to wake up & get our boy ready. I looked at these three women who were such a positive presence- emotionally, verbally, physically & of course in terms of care- throughout this last critical stage. I knew in that moment looking at them that there was no way I wanted to wait for a whole new care team in the next shift to guide me through the very last stage of this experience. I wanted these women there, guiding me through the pushes & labor & seeing my baby. Tears stream down my face with the memory of telling them I was ready, it was go time & I wanted them to guide me through the birth of my daughter before their shift ended. We got straight to it. During the previous hour, after I had reached 6 cm dilation, they had me getting into various positions to prepare for labor pushes. Now that I was at 10 cm the pressure downward was intense. The epidural had eliminated the pain of contractions but the pressure of impending labor is definitely a trip! The midwives initially got me into one labor position, lying on my left side with one right leg in a type of leg harness. The pressure intensified in this position & they began guiding me through pushes. At some point I needed to change position, so they had me get up on my knees, facing the back of the hospital bed (which was upright in chair position) & squatting down, pushing. I still recall the feeling of her head descending & how one of the midwives noted to the others that she knew how ready I was based on my grunts & low rolling groans. I still recall how cautiously they guided me through pushing her head out & then the immense relief of feeling her head completely emerge & soon the rest of her body. Krystar oforserat, fin progress. Mandelolja används och varm hannduk. Verbal guiding vid huvudets framfödande. Kön: flicka, skriker omedelbart och tas upp i mors famn. Vitalt barn. 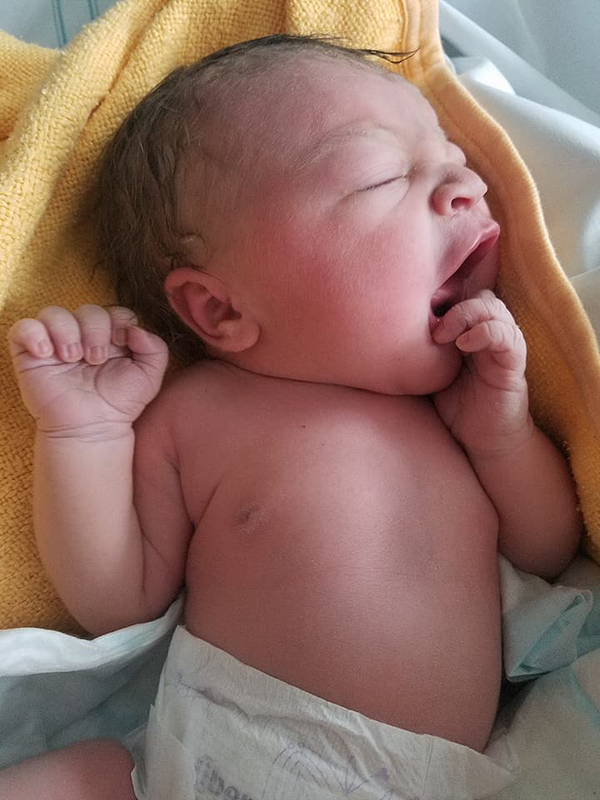 Within about 40 minutes of being checked & at 10 cm to starting labor pushes, my daughter Zoë was born. As soon as she was out I was almost frozen with disbelief. It’s over! I did it & my baby girl is here!! I think I was so overcome that I had a hard time turning around but the midwives assisted & immediately put my daughter skin to skin. 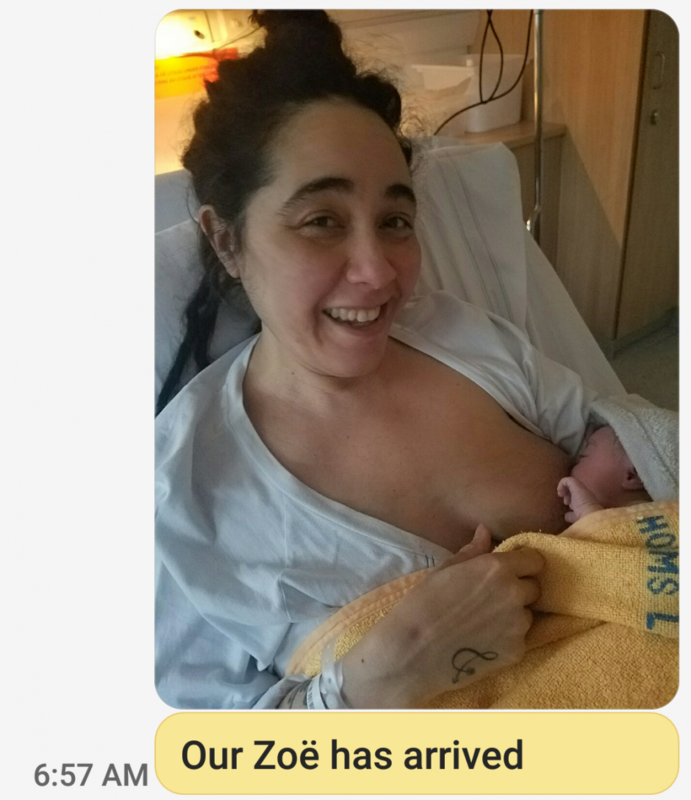 Among my very first texts sent to my husband after birth, capturing her first full breastfeeding session. A couple hours after birth, in my lap. 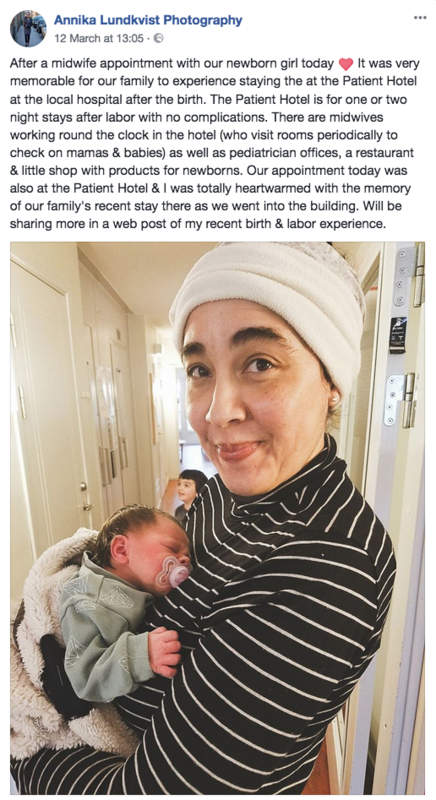 After the midwives attended to my after birth care, their shift was coming to an end. I have such a fond memory of these three women. Relaxing with my daughter in my arms, I thanked them profusely for all of their wonderful care & support. In return they thanked me for being able to be part of the birth. What humility! After they left I had some quiet time to just relax with my newly born daughter. 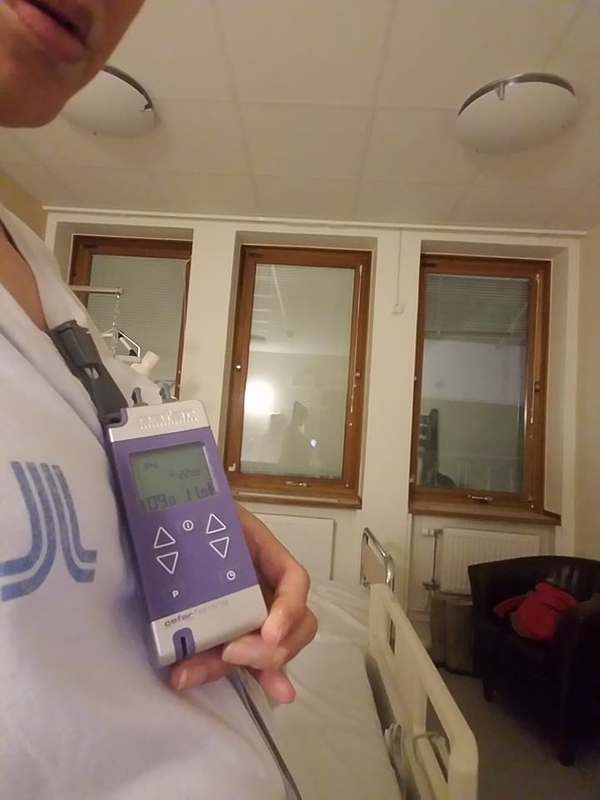 Because my labor went without complication, I would be released soon to check into the Patient Hotel on the hospital grounds where I could stay with my newborn and family for up to two nights. Above: Excerpt from my hospital record, this note was included in follow up notes after birth. 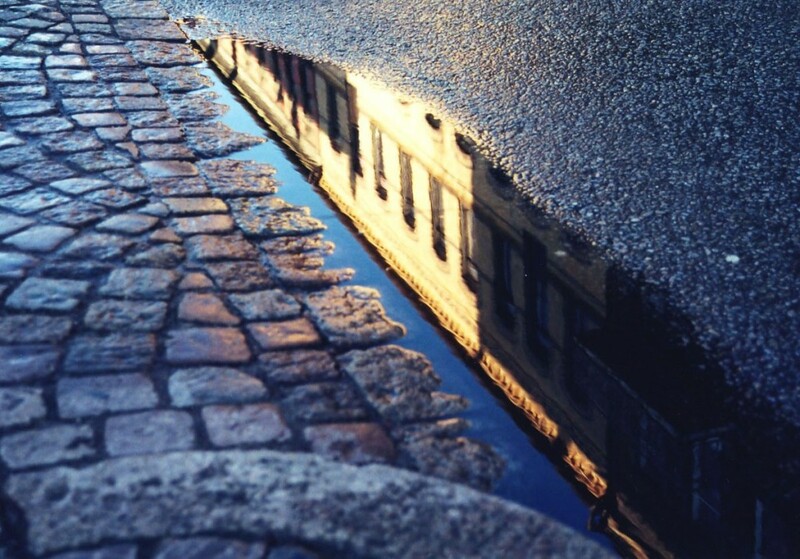 The ‘fika’ is a Swedish (or generally Scandinavian) social institution, in simplest terms indicating a coffee break. It can be used as both a verb and a noun. 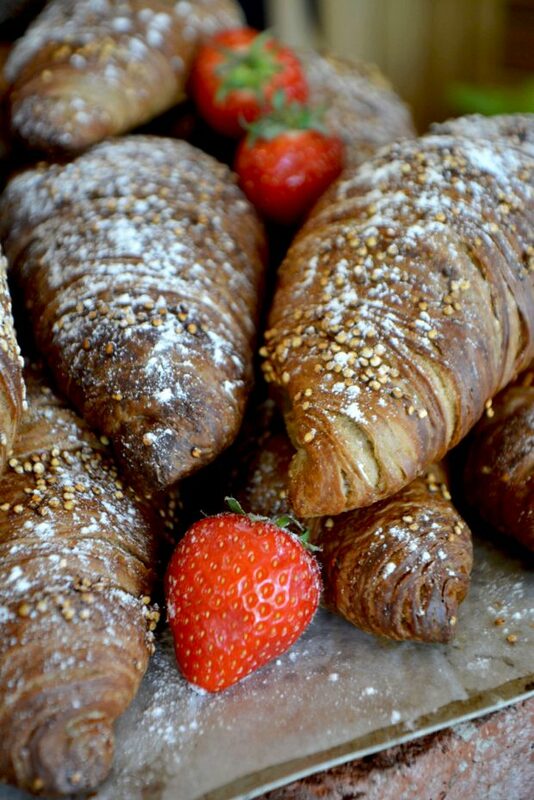 You may ‘fika’ with a good friend or have a ‘fika’. I love how the term even winds it’s way into after childbirth plans! 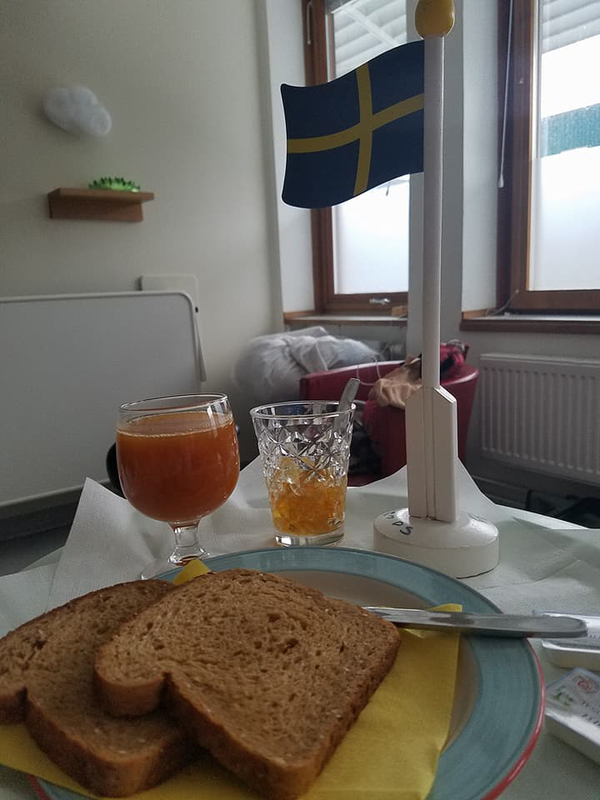 It is tradition that you are brought a sweet little tray with coffee, juice & a snack after birth (this was my ‘fika’). They had to do a bit of rummaging for my vegan request but I gladly accepted the couple of slices of toast with orange marmalade & margarine and glass of nyponsoppa. Oh! What about Mike and Hunter- my son & husband- right? Were they on their way or what?! I think with the way things were going that week, he might have very well gone to bed expecting to wake up & just check in with me & hear that things had progressed a little, not that the event had already occurred! Siblings (perhaps especially young active ones) are not permitted in the labor & delivery ward (it is possible our son was allowed on a couple of earlier visits as they were drop in checks and he was sleeping). So I told Mike to relax & just take his time that morning with breakfast, getting prepared & to meet me later at the Patient Hotel. 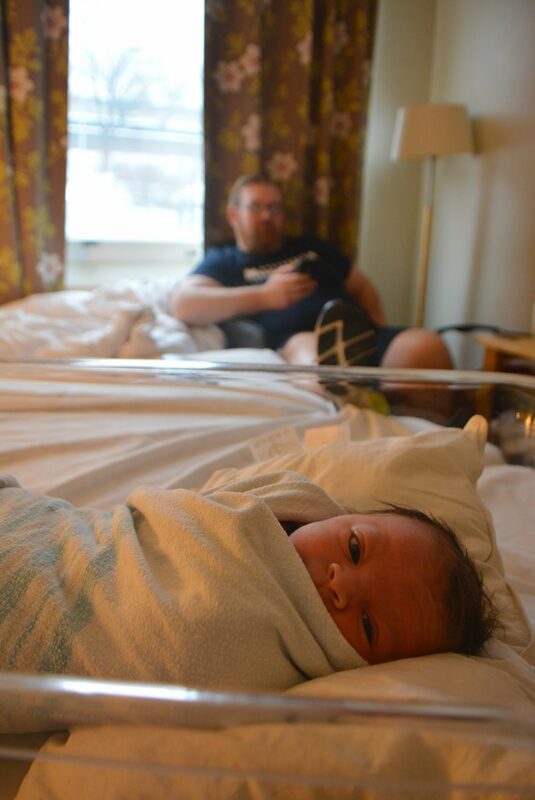 I took this photo about three hours after Zoë’s birth right before hopping in the shower. I needed to get cleaned up before the transfer to the hotel. By this time the day shift of midwives was well underway & I had met a few of them as they continued to check in on me & my daughter. Two of them came in to sit next to her as I got showered & dressed. 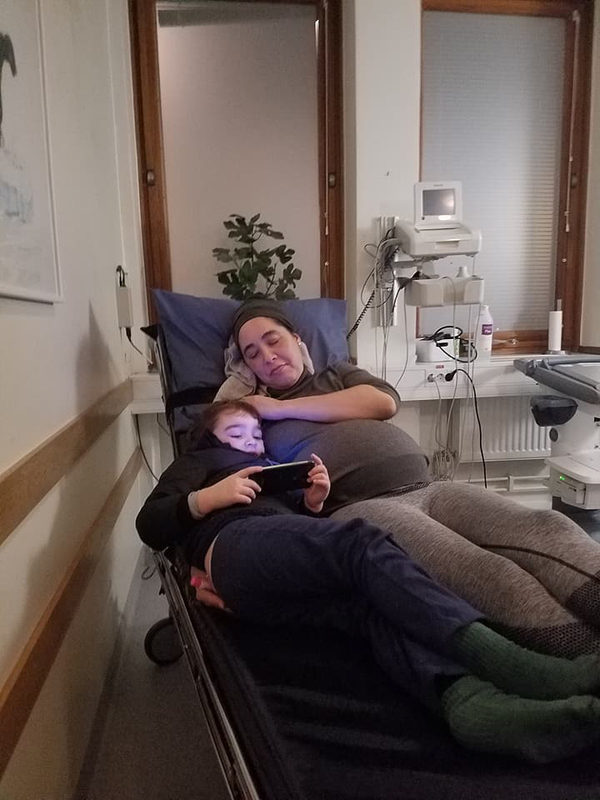 I had already sent out a birth announcement to close family members & my aunt in Malmö had a sweet congratulations as well as mentioned that one of the Swedish princesses had given birth right at that same hospital. I thought I had indeed read that before (I didn’t realize she was talking about this day) so didn’t think too much of it. When I got out of the shower, one of the midwives asked me if I had looked at the news. I said uh oh, wondering what she was about to tell me was going on. 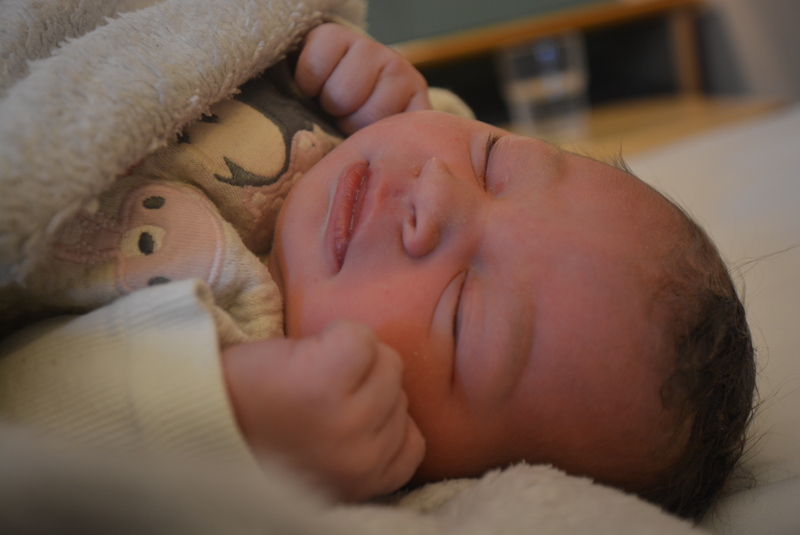 ‘Oh no,’ she said, ‘it’s not bad news!’ It turns out that just that same morning one of the Swedish princesses (as my aunt had been referring to) had birthed her third child right there in the same Labor & Delivery ward. “She didn’t have a special room? !” I asked, shocked. If anything, I thought, for security reasons she would. “Nope,” the midwife responded. 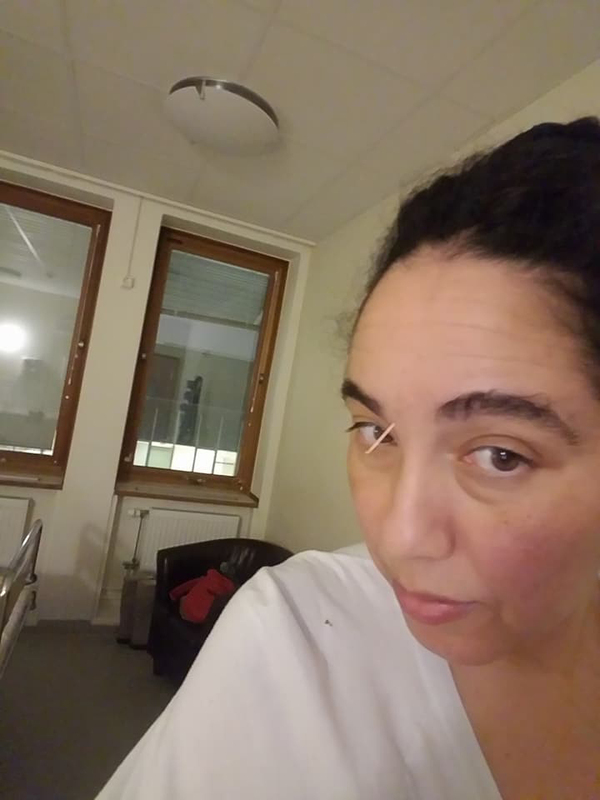 She was just right there in a regular Labor & Delivery room, her security team at some point having a coffee (the Swedish “fika”) right down the hall. I chatted with the two midwives a bit more as I got dressed & they congratulated me again & we said our goodbyes. I got my daughter dressed & ready for the transfer to the hotel. Two gals soon showed up while I was breastfeeding to take us to the hotel. Zoë did not seem willing to unlatch so I got into the wheelchair with her still feeding & they carried my bags & pushed the wheelchair to the elevator, down some levels & then on a good 5 minute walk or so through underground corridors to the Patient Hotel which is a part of the hospital. 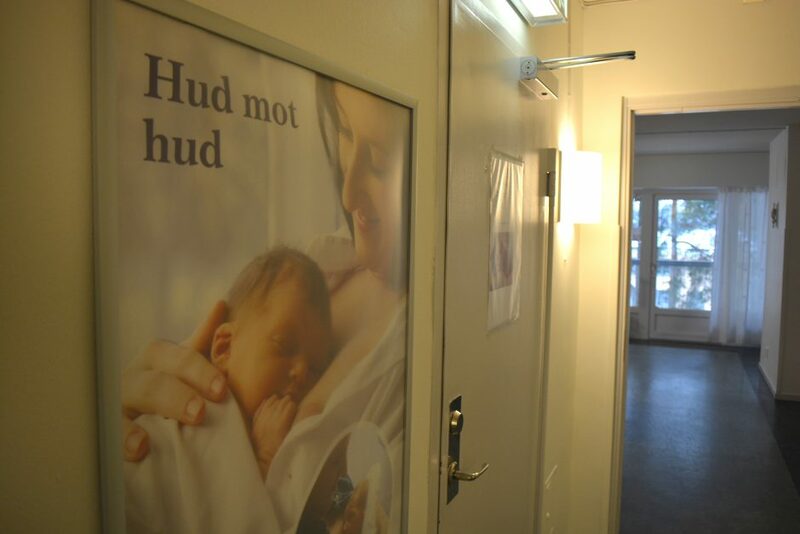 The Patient Hotel is where mothers who had labor without complications go to stay one or two nights after labor. 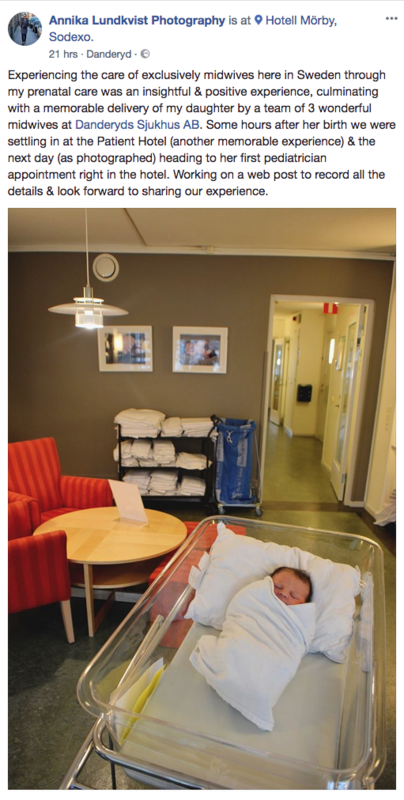 The hotel is part of the hospital & in addition to rooms for mothers, newborns & family to stay in, there are midwives on shift all around the clock who periodically check in with all mothers & newborns right in the comfort of their guest rooms. 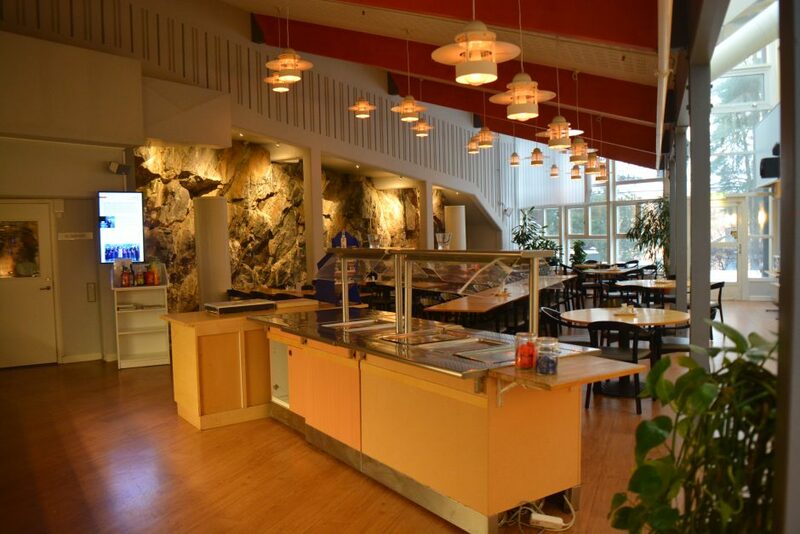 There is a restaurant (nice cafeteria style) & a little shop with goods for newborns & mothers. There are also pediatrician offices. I already saw an issue with the bed in our room- it wouldn’t work for all 4 of us to sleep there (our four year old needs the space of an adult in bed). So while my husband & son were en route, I did warn him that they may just be able to spend the day there. 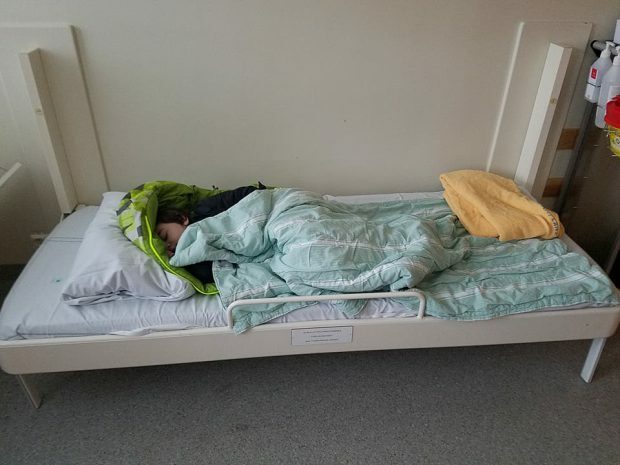 But when the midwife came to check in on me & I mentioned my family coming & whether perhaps there were cots for siblings, she said no problem, that in fact we could just get another bed sent up to the room. I’m sure some people will be curious what the cost of this all was. 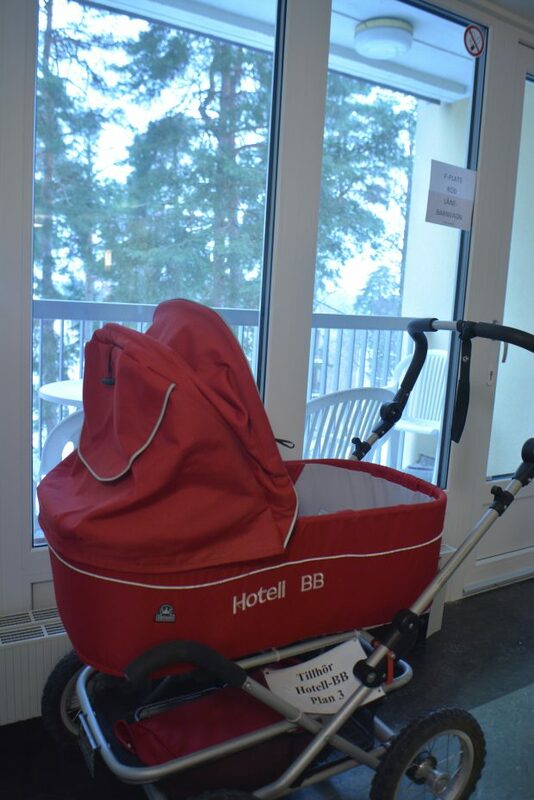 For mothers the stay is covered by health care- there is a nominal fee of 100 SEK (Swedish Krona)- currently about 12 USD. Meals are included for mothers. 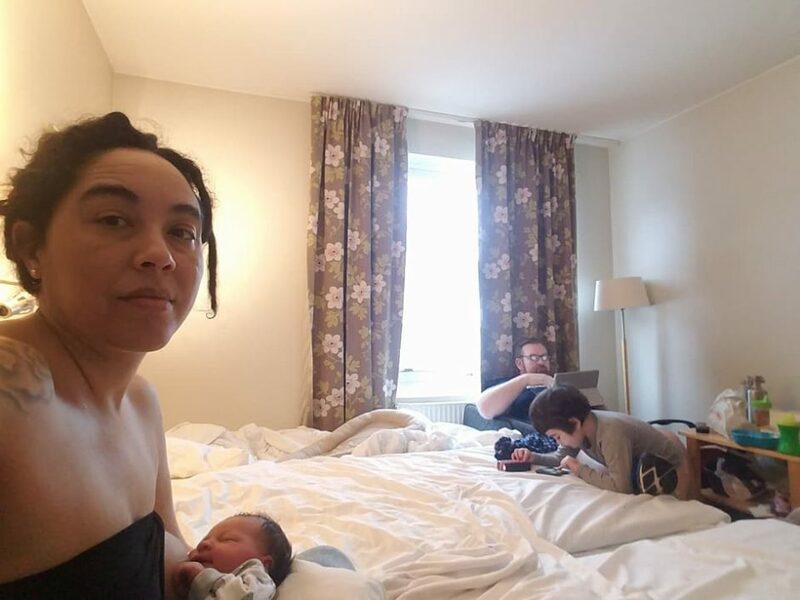 There is a charge for family members & I don’t have my husband’s receipt anymore but the fee for him, our son & the charge for the extra bed for one night totaled approximately 400 SEK or 50 USD. This concept was new to us & I loved it. After birthing my son in Hawai’i, my husband slept rather uncomfortably in a slightly reclining chair in the hospital room for the two mandatory nights I was required to stay. Although my birthing experience with my son is very memorable for me, those two nights in the hospital were not & I remember how excited we were to leave after the mandatory stay. The experience of staying in a basic but comfortable hotel room for a night after birthing my daughter allowed for a relaxing segway to heading home the day after birth. Our son was thrilled by the experience too. The convenience of midwives being able to come directly to our hotel room to check vital stats & answer any questions was wonderful. The day after birth, an hour or so before we checked out, our daughter had her first pediatrician appointment just a couple floors up from our hotel room & two days later we returned for another appointment for her with a midwife & her first hearing test- all right in the patient hotel. Relaxing in mama’s lap at the Patient Hotel- waiting for brother & daddy to arrive! Around the hotel there were many beautiful newborn photography portraits as well as informational posters on birth and labor, such as the one above, a hospital podcast about giving birth & the one below about the importance of ‘skin to skin’. 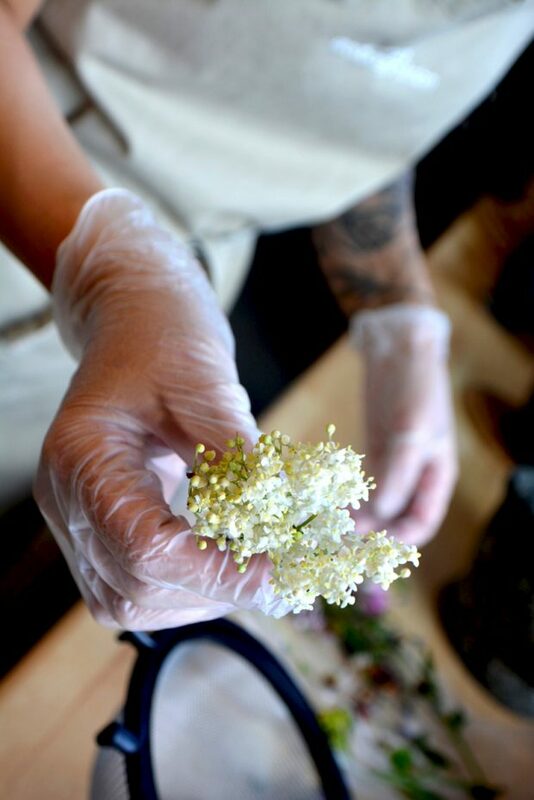 Both of my labor & birth experiences are among the most significant events of my life, of course for bringing forth my children but also for the fine details of each experience- emotionally, physically, environmentally. While this labor & birth experience seemed like a long, sometimes lonely & difficult road, there was a very special point in the last few hours when I was grateful for the struggle, for being forced to cope through it on my own for a time. Feeling my body work throughout the week leading up to childbirth was one of the most necessary parts of the experience I realized. After it was all over, it’s time to immerse in the cocoon of those first newborn days & weeks which have been the most rewarding, humbling, love charged experiences I have ever had.